I remember, fondly, my father making breakfast when I was a kid. So it’s natural I’d want to make breakfast in my house, for my kids. It’s what I’m known for now, especially my pancakes. It’s true I also make waffles, French toast and eggs — scrambled, fried or omelette’d. But I’m known for my pancakes. It’s not that I can’t make other meals. I can. I’ve been known to make some mean desserts and even some dinner-type foods or something on the barbecue. But what I really do is make breakfast. And my favorite breakfast to make is … pancakes. Quite simply, I love breakfast foods. I get excited about them. I get my kids excited about them. There’s many a weekend morning (or even on school days) where I’ll tell my girls I’m going to make pancakes, eagerly anticipating the squeals of glee. They get so excited they tell their friends about it. And they don’t just tell their friends that I make breakfast, they tell their friends about my pancakes. So, it’s what I’m known for. From a business point of view there are a lot of things I understand and a lot of things I know how to do. Sales, marketing, technology, business strategy — I’ve worn many hats in my day. There’s a lot I can say about what it is I do, but that’s where I need to be careful. It’s not bad to be able to do many things. It just makes it harder for people to understand…and remember. Even more important, it’s tough to get people excited about too many things at once. What I have found, though, is people remember the things that make ME the most excited. Lightly mix wet ingredients in a small bowl. 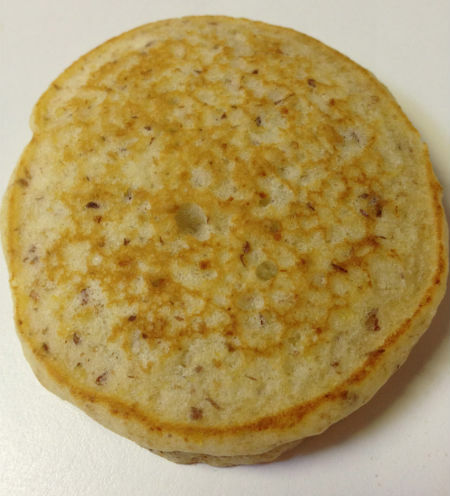 Cook pancakes on a preheated griddle (375 degrees), or on a skillet over a medium flame. The pan is hot enough when drops of water “dance” across the hot pan. Pancakes are ready to be flipped when the top side shows lots of bubbles on the surface. Makes about a dozen palm-sized pancakes. Enjoy!